It is mandatory for every taxpayer in India to be a registered user on the income tax department website. Being a registered user, one can access previous years tax returns, e-verify the income tax returns, check refund status etc. Minor, lunatic or idiot and those who are barred by Indian Contract Act, 1872 are incompetent to register on the income tax portal. On the homepage of the government portal, click on ‘Register Yourself’ on the right hand side of the page. 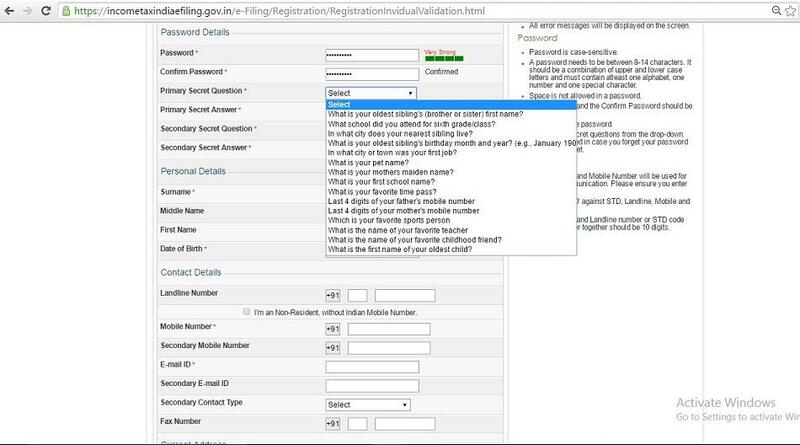 Once you have clicked on that button, you will be taken to a registration form that will ask you to select your user type. After correctly entering all the details, click on submit. On submitting the duly filled form, a six digit One Time Password (OTP) is sent to your mobile number and the email ID provided. Enter this OTP correctly to successfully verify the details. Please note that in case of non-residents the OTP is only sent on the registered email address. The OTP will expire after 24 hours from the actual time of receipt. In case one fails to complete the registration process within the given 24 hours, the entire registration must be initiated again. 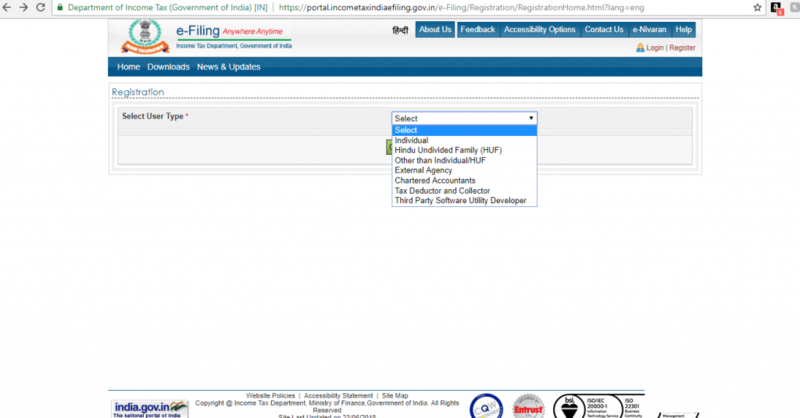 To access the Indian income tax login page, visit the homepage of government portal. 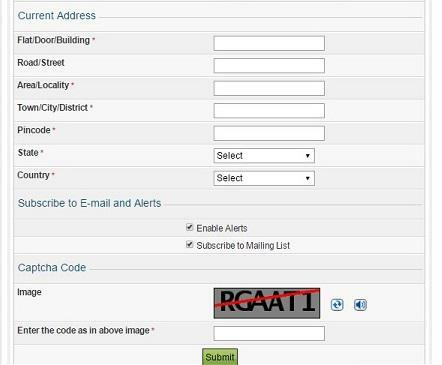 Here, you will see a box on the right side that has a ‘Login Here’ button for registered users. Once you have clicked on that button, you will be taken to the login page where you have to enter your income tax login username and password. 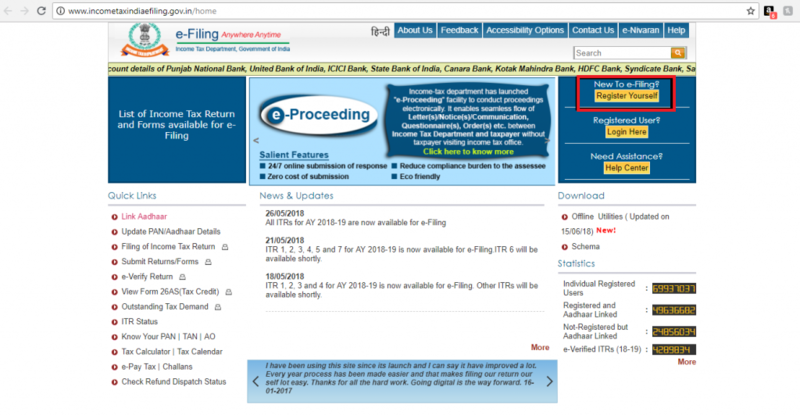 Please note, for Income Tax Login, the User ID is your PAN Card Number. Did you know that you don’t have to bother about your income tax login details if you e-file on ClearTax? You can login easily using your Google account.